Being a teen, we always tend to act differently. We feel that we are the most confused people but at the same time, we may also feel that others are dumb. We know better than them. Boys and Girls undergo a lot of physical and hormonal changes which sometimes changes our behavior with people around us. It’s a crucial turning point in our life. Depression sets in for no reason, you may not even know why you are depressed. All you know is that you are sad for no reason. Remember that it’s completely normal and everyone has dealt and is still dealing with it. Today, let me share the story of a teen who was growing in the Lord. In her childhood, she had the habit of carrying tracts in her bag. She would share these tracts with random people around her. But as she grew up somewhere she lost this habit and forgot all about sharing the gospel. One day the preacher in her church reminded them about sharing the gospel with people and how important it was for them to have a burden for people around them. That day God spoke to her and reminded her of the burden that she carried when was a child. she Now being a teen, she was a bit shy to speak to random people. Nevertheless, she started carrying the tracts in her school bag and tuition bag. She used to always buy stationery from a shop regularly as the shopkeeper would give her stationery’s at a very discounted price. Every day she would pass by the shop, she would greet him. One day as she took money out of her bag to pay the shopkeeper one of the tracts fell on the table. Th shopkeeper read the heading and asked about it. The girl replied that it speaks of Jesus Christ, would you like to read about it? Surprisingly he said, Yes! She was so overjoyed and gave him the track. The man started reading it and he was keen to know more about Jesus Christ. Every time the girl met the shopkeeper she would give new tracts to him. One day the shopkeeper said that he wants to know more about Jesus Christ, what should he do. She promised to get him a Bible which he could read and know more about him. The next day she gave him a New Testament Bible, the man was overjoyed to receive it. He was a very old man, but the joy he had in his eyes was like a child. The teen soon moved from that place. She never got to see that shopkeeper again. But she still believes that God worked in the life of an old shopkeeper’s life through a teen. She believes that he has received the salvation. Today, if you are teen and you if don’t know what purpose do you have in life, kneel down in the presence of God. Seek his will in your life and he will reveal the hidden manna for you. He is a GOD who spoke to Samuel when he was still a child, he is GOD who used Naman’s little servant girl. So, never belittle yourself. There are no coincidences in life, everything is planned. If you have been involved actively in the ministry, don’t backslide. Continue doing it strongly for the glory of God’s Kingdom. Be victors in Christ. Based on a true-life story. 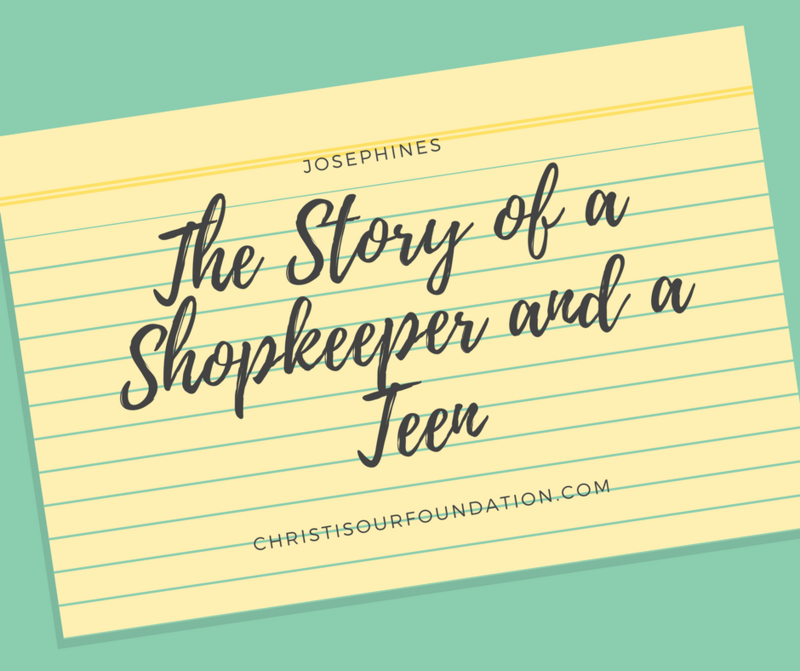 This article was posted in the category Josephines/Teens. To Read more such contents check here.